A powerful storm system lifted northeast across Missouri and Illinois Sunday, November 25, 2018. 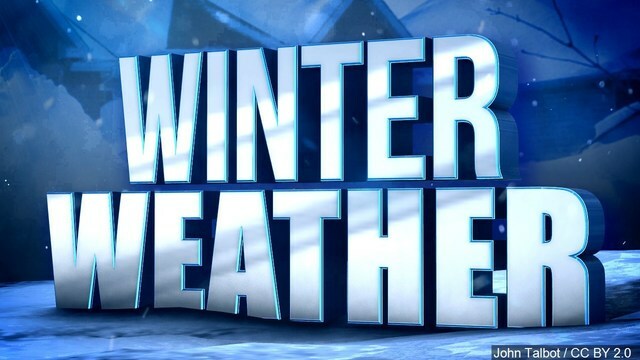 Due to the system's slower than anticipated arrival, snowfall forecasts along and northwest of the Illinois River were increased. 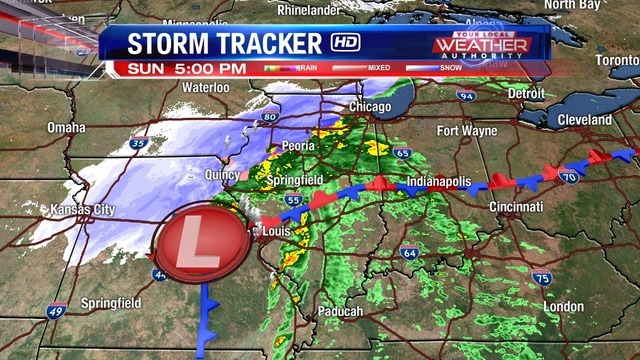 Snowfall amounts were expected to sharply decrease east of the Illinois River, toward I-55. Peoria (near Grand Prairie): 6.0"
Peoria (near Richwoods High School): 5.0"
Peoria (near Willow Knolls): 5.0"
Peoria (near Allen and Willow Knolls): 4.5"
Glen Oak Park, Peoria: 3.5"
The forecast called for difficult, if not impossible, travel conditions north and west of the Illinois River. The combination of wet heavy snow and strong winds creating whiteout conditions was going to make roads difficult to maintain. The strong winds and heavy snow were also expected to cause power outages and bring down trees. 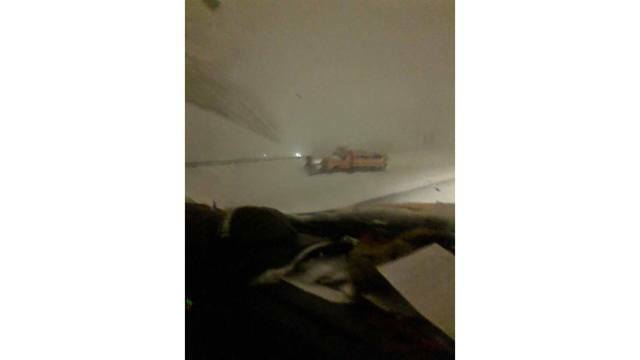 Late Sunday night, motorists found themselves stranded on I-74 between Galesburg and Quad Cities as very heavy snow and strong winds made clearing the roads difficult. Snow plows were running off the road and getting stuck in the snow due to zero visibility. Strong winds knocked out power to thousands of residents in Central Illinois and brought down trees in McDonough and Fulton Counties. The snowfall forecast was accurate for the most part. The highest snow totals were expected across Knox, Henry, Stark and Bureau counties where we projected widespread accumulations of 7-10 inches with localized accumulations up to one foot. 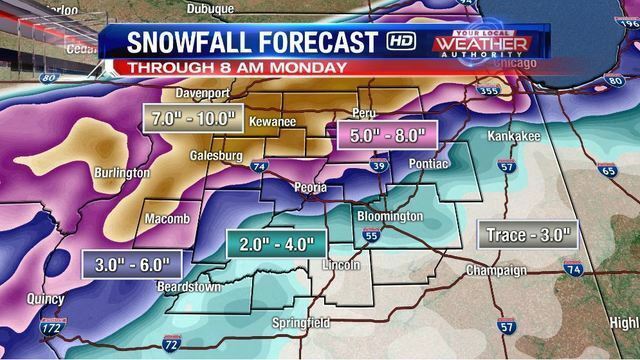 Snowfall amounts were expected to cut off quickly east of the Illinois River and south of I-74. We expected totals in the Peoria area to range from 5-8 inches on the north side of town with 3-6 inches on the south side. As stated above, snowfall amounts in Peoria ranged from 4-6 inches. East of the Illinois River across Tazewell and McLean Counties, the snowfall forecast called for 2-4 inches but it was said many times that these areas would likely end up on the lower end of the range if they got there at all. In the end, areas south of a Pekin to Bloomington line generally ended up 1-2 inches of snow, about an inch less than expected. Snowfall amounts were also a little lower than expected across eastern La Salle and Livingston Counties. Interpolated snowfall analysis based on observations.